^ 无奇不有 世界十大“私人国家”. 人民网. 环球网. [2019-02-14]. ^ 泥仔. 這裡是國家，也不是國家. 蕃薯藤. 地球图辑队. [2019-02-14]. ^ Benjamin Elisha Sawe. 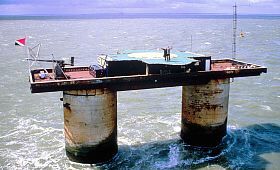 What Is A Micronation?. WorldAtlas.com. [2019-02-14]. ^ John Sack. Report from Practically Nowhere. iUniverse. 2000 [2019-02-15]. ISBN 9780595089185. Anonymous. Prince finds if all else fails, secede. The Daily Telegraph (Sydney). 2003-07-24. Alex Blumberg. It's Good to Be King. Wired. March 2000 [2009-07-03]. Adam Clanton, "The Men Who Would Be King: Forgotten Challenges to U.S. Sovereignty," UCLA Pacific Basin Law Journal, Vol. 26, No. 1, Fall 2008, pp. 1–50. Dapin, Mark. If at first you don't secede .... The Sydney Morning Herald. 2005-02-12. Bruno Fuligni. L'État C'est Moi: Histoire des monarchies privées, criptarchies (L'État C'est Moi: History of private monarchies and cryptarchies). Max Chaleil. 1997. Peter Needham. Born to rule. The Australian. 2006-09-26. Nick Squires. Mini-states Down Under are sure they can secede. The Daily Telegraph. 2005-02-24.